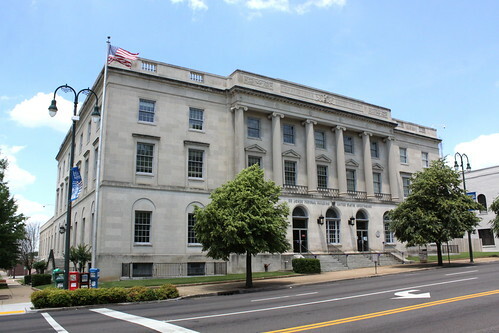 Located across the street from the county courthouse, this federal courthouse was built in 1934. It was used until 1998 when a newer courthouse was built next door (to the left from this vantage point). Still, several federal agencies use this building. 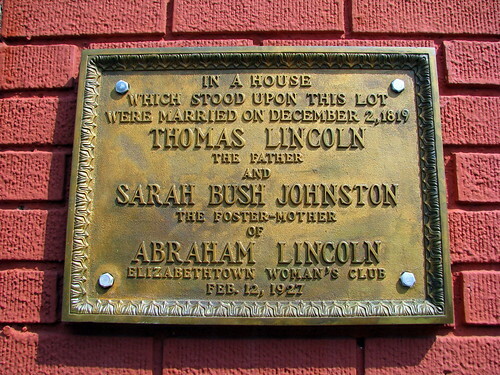 In 1988, The building was named for U.S. Congressman Ed Jones near the end of his 20 years of serving as a representative. Ironically, that Ed Jones isn't the most famous Ed Jones from Jackson. Long time Dallas Cowboy and 3x Pro-Bowl Defensive Lineman Ed "Too Tall" Jones also grew up in Jackson. I grew up as a Cowboys fan until the Titans moved to Tennessee, so for a brief moment I was excited that this building could have been named for someone other than a government official. Alas, it was named after a government official and not a popular athlete. 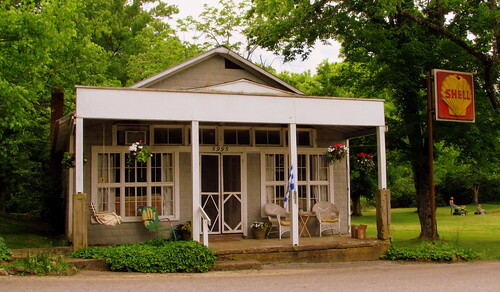 For many years, highway TN96 ran through the tiny community of Fernvale, TN in Williamson County. When traffic was routed onto a more modern highway, the station here was soon abandoned. Over the years, some friends and I would use this building, which used to be very run-down, as a landmark for driving directions to get to a cabin. the instructions would say "Turn left at the abandoned gas station." 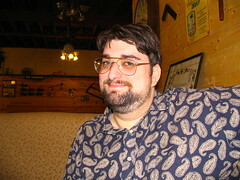 Then, about 15 years ago, someone bought the place, fixed it up, and turned it into a small country market. It must have been short-lived as now it looks like a private residence. 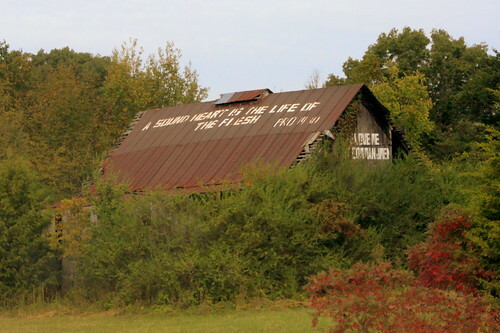 There are plenty of barns along the old backroads advertising all kinds of products and tourist attractions, but this is the first one I've seen with a Bible verse or two, although I suspect there are plenty more out there. On the roof, it quotes Proverbs 14:30: A sound heart is the life of the flesh. In the front of the barn, the verse is partially obscured, but I'm going to guess it's John 14:15: If ye love me, keep my Commandments. This barn is on Highway TN68 in Monroe County between Tellico Plains and Madisonville. 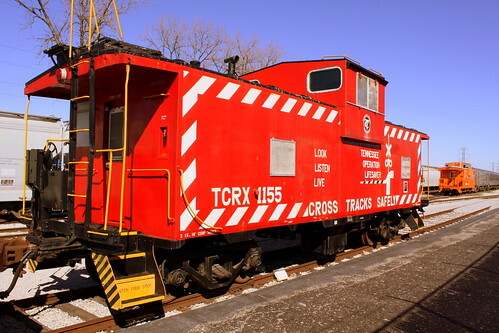 This caboose is part of the rolling stock on display at the Tennessee Central Railway Museum. I would assume the Operation Lifesaver markings are a relatively newer painted addition to the caboose. I don't know if they leave it here, or if their excursion trains sometimes take it along for educational purposes. The caboose they usually take is the orange one in the background on the right. 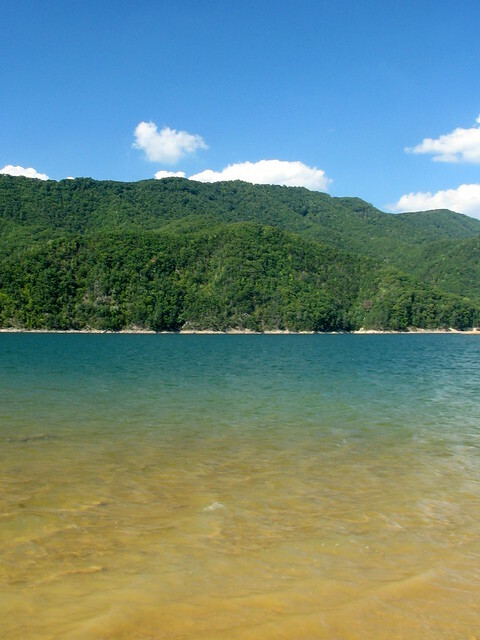 The Lake was formed after the creation of the TVA Watauga Dam in 1948. 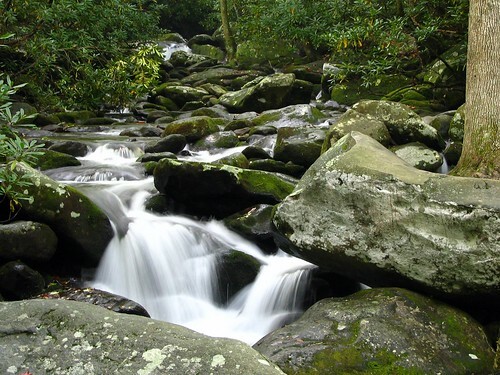 The entire area is in the Cherokee National Forest. This specific vantage point is at Watauga Point just off highway US 321. 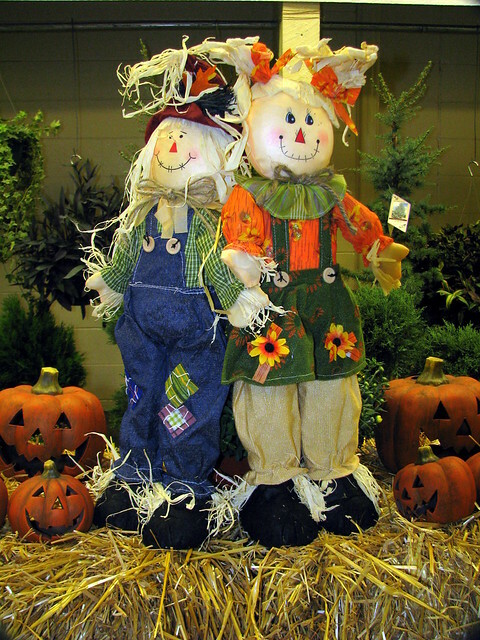 At the 2008 Tennessee State Fair, these decorative scarecrows and jack-o-lanterns were in an annex building between the Creative Arts building and Exhibitors building. These were for sale, along with fall plants such as mums. The small town of Loretto in Lawrence County has conveniently put historical markers all over town for the minor points of interest. Also, someone was kind enough to trim the vines so that I could see a historical marker was in there. 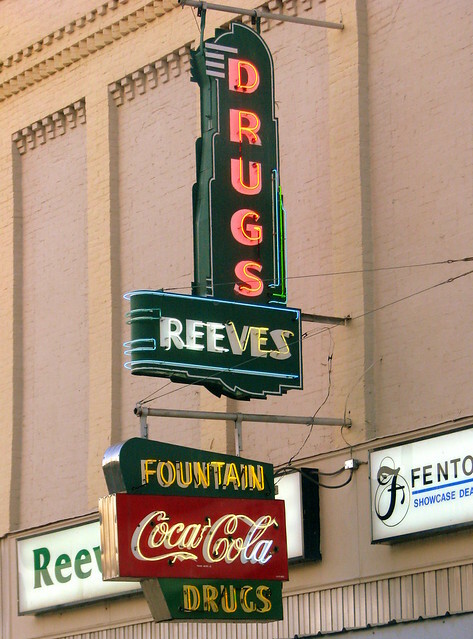 This Theater was built in 1948 by James Robinson and operated until the 60's. As you can tell from the picture, in the half century since then, the roof has fallen in and someone has used the building to stow junk. 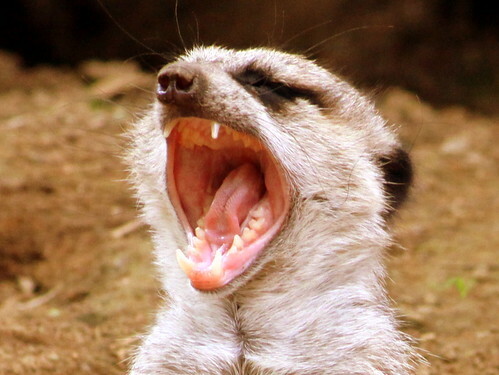 Everyone knows that Meerkats aren't scary. Instead, I just caught this one while yawning. I 'm not trying to burst your bubble, but I wasn't only two feet away from him either. 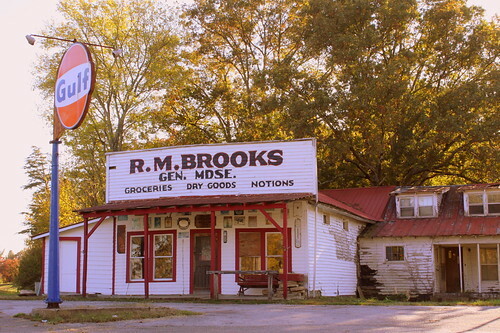 This old fashioned general store isn't in the historic area of Rugby, but is a couple of miles down the road on TN52. According to the wooden sign above the front door, at one time this was the post office for Rugby with a zip code of 37733. However, according to the USPS website, there is no Rugby post office now, which is evidence that this store isn't open anymore. Today, highway 52 curves in front of this store at this intersection. TN52 used to continue on the right side of the picture. That was until 1999 upon the completion of the new Brewster Bridge causing the old road to be barricaded. The real world drink was introduced in 1965 under NuGrape, a former brand of The Monarch Beverage Company. That year, Nugrape worked out a deal with Al Capp, the owner of the Kickapoo Joy Juice rights, to produce the beverage as a carbonated soft drink. Capp, however, would have the last word on all advertising and promotion. 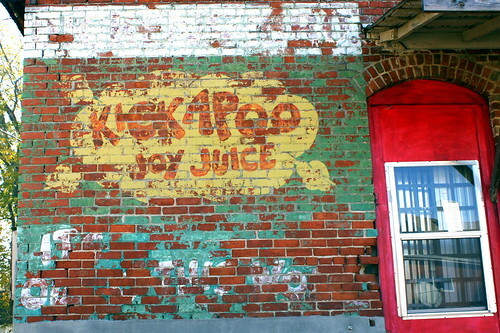 Kickapoo Joy Juice's early advertising campaign was very similar to Mountain Dew's of the time – using characters from Li'l Abner to create and market a hillbilly feeling. Although the product is currently distributed largely in Asian markets, the can still comes decorated with a vintage Li'l Abner drawing. 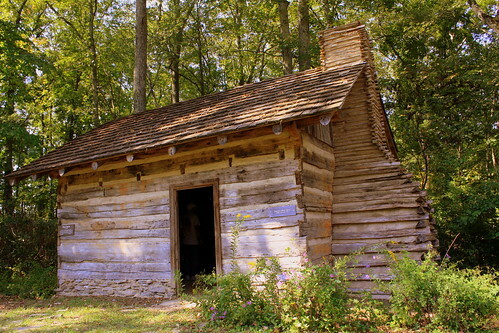 According to the plaque on the restored cabin, this was originally located in Cherokee, NC as it was the cabin of Chief Squincy Bird. Today, it is seen along the Reflection Riding Trail at the Chattanooga Nature Center. 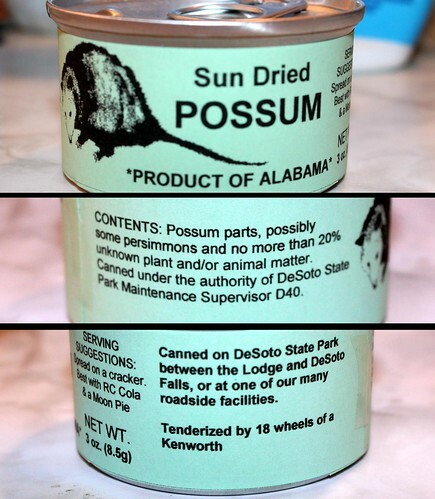 This product actually exists, thanks to the fine folks over at DeSoto State Park in Alabama. It's for sale at their gift shop for under a dollar. Several people have asked me what it's like when I open it. I don't plan to open it. Often as a gag gift, I will get my father-in-law a weird animal meat product. In past years, I've gotten him Rattlesnake meat, silkworm pupa and Squid with ink in a glass jar. On February 24, 1978 at 2:55 PM, two days after 24 cars of a Louisville & Nashville train wrecked on this site (The tracks are behind me across a street and behind a fence), workmen were cleaning up when 22,000 pounds of liquid propane fuel from a derailed tanker car ignited and caused a massive explosion. The blast and resulting fire destroyed a great part of Waverly's old town section that included homes and businesses. Sixteen people were killed in the disaster, including Waverly's police and fire chiefs. 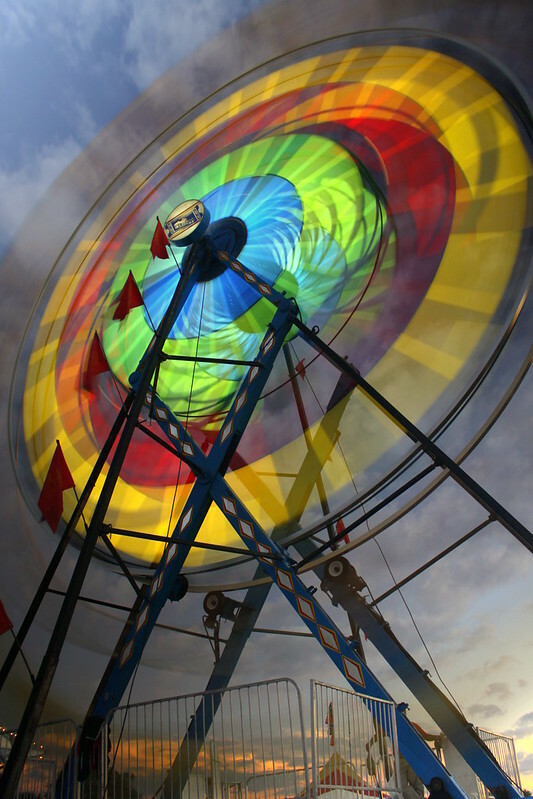 More than 200 people suffered injury, and damage was in the millions of dollars. 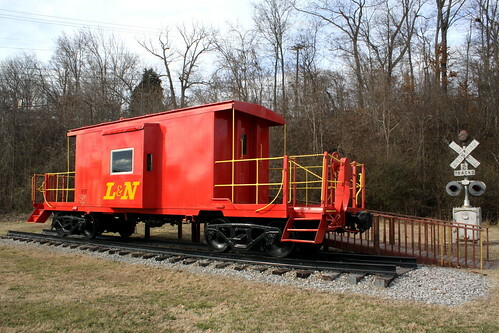 Today at this nearby site is an L&N Caboose, which also functions as a museum. Even though I stopped by on a Saturday in January and nobody was around, the door was unlocked. If you happen to arrive when the door is locked, there is a sign in the window for who you can call to have the door unlocked. 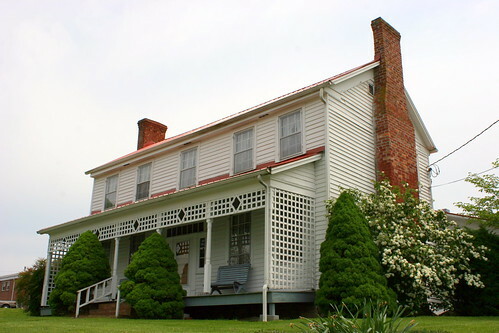 Located along the main road through town (US25W) and across from the county courthouse. Hoskins and the Ritz Theater next door appeared to have an Art Deco storefront. 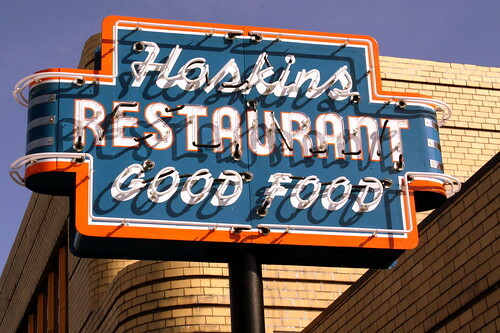 Hoskins is also a Rexall Drug Store, so it looks like it started out as a soda fountain and the sign on the front of the door claims they have been voted the best burger in town. 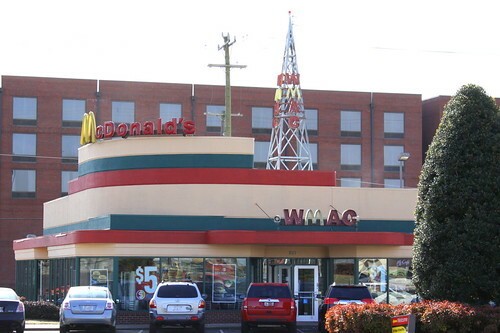 Located on Music Valley Drive in the touristy Opryland Area of Nashville is WMAC - a McDonalds with a radio station on the inside. The antenna you see is the actual broadcast antenna, and there is radio broadcasting equipment inside, too. I believe this was setup in the early 90's. After several years, the low wattage broadcast equipment broke, and since the novelty wore off, they kept the look but didn't fix the broadcasting. This beautiful Rock City barn has been well maintained, and the farm is for sale so it can be your for the right price. This barn is located on state highway KY91 about halfway between Princeton and Hopkinsville, KY. It's in Christian County, but it's just about a mile from the Caldwell County line. 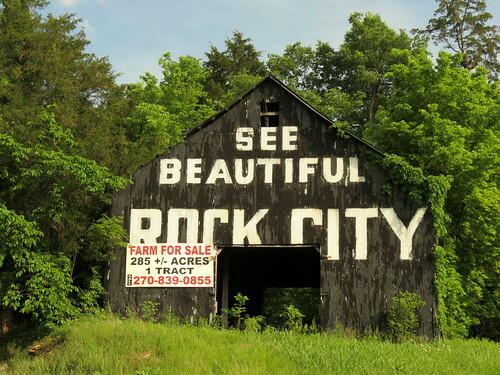 This is now one of 84 different Rock City Barns I have photographed and uploaded to Flickr in my Rock City Barns set. People often ask me how I've found so many of them. I have drawn from many resources such as books and web sites and sometimes luck, but there's not really one "go to" place to find them all. Well, now on my website, I have tried to create a one stop source for the locations of all of the barns I've been to. On my Map of Rock City Barns page, I have plotted each barn on a Google Map. 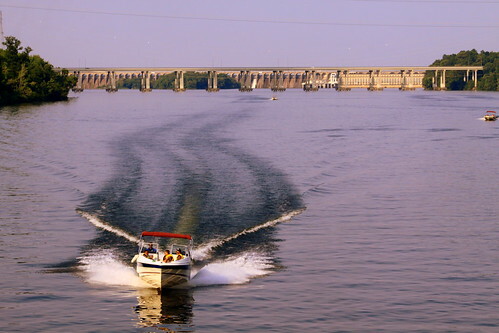 The calm waters of the Tennessee River below the Woodrow Wilson Dam make for a popular boating spot in the Florence/Sheffield/Muscle Shoals area. 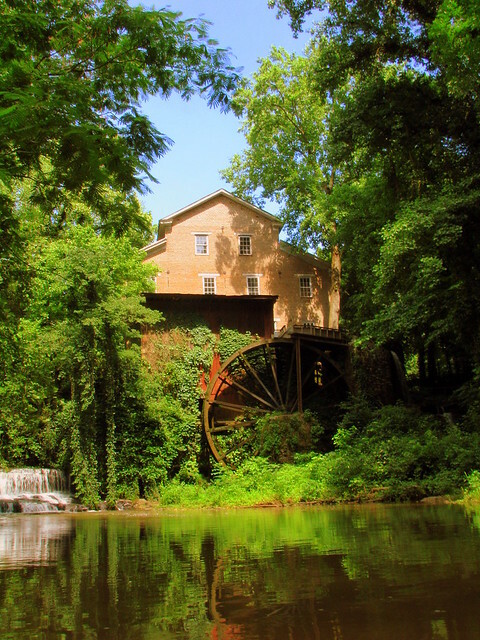 This picture was taken from the Old Railroad Bridge. 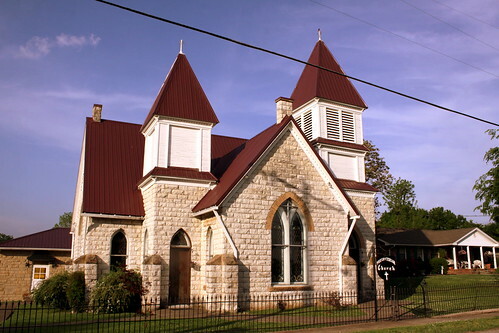 Skullbone is a small community in West Tennessee located at the intersection of highway TN105 and Shades Bridge Rd. 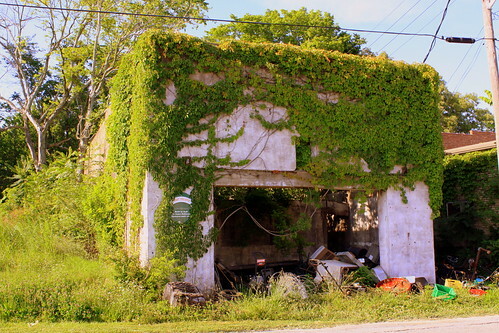 Or, perhaps a better explanation is: what you see here is Skullbone, TN. 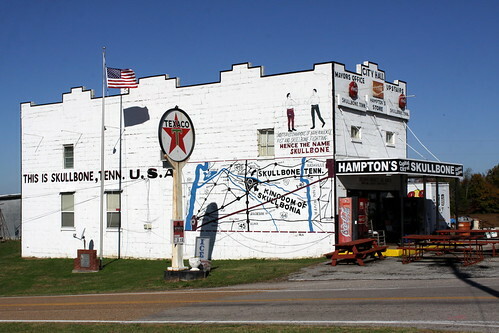 The main (or only) attraction in Skullbone is Hampton's General Store, a building from 1898 which over the years also served as a post office, gas station, City Hall and Mayors Office. Under the awning, we read that the store (addressed as 102 Davy Crockett Ave. North) has been owned by Landon & Ruby since 1964. By reading around the awning, we also see that Skullbone is the "Capital City of Skullbonia." So, Where did the name Skullbone come from? For that, we look at the murals on the side of the store. This region was home to the "Undefeated Champions of Bareknuckle fist and Skullbone Fighting: Hence the name Skullbone." Want to learn more about Skullbone? Check out this website, which includes the text of an interesing letter. In 1952, the locals wrote a jovial letter to TN Governor Browning petitioning the state to officially recognize the kingdom of Skullbonia.